Over the years I’ve heard many different ways that children with dyslexia have described the way that text looks on a page when they read. Many people assume that dyslexia is a visual problem however there is a lot of confusion and misunderstanding about the issue so I think it’s important to clarify the link between dyslexia, the eyes and vision and what you can do to help you and your child. At least one in ten people in the world have dyslexia or a closely related condition. Consequently, they have some very specific difficulties which can impede learning certain things. However, what they find difficult will be individual to them. What are visual tracking difficulties? What are Binocular Vision Difficulties? What are the difficulties with focusing? How do I know if a child is struggling with their vision? How do we diagnose these difficulties? What can you do about these visual problems? Dyslexia is a Specific Learning Difficulty (SpLD) that affects around 10% of the population. Dyslexia does not only affect reading and writing, but can also impact on spelling, maths, memory and organisational skills. Unfortunately, many Dyslexic children are not correctly identified, as teachers are not always able to recognise the signs. Research shows that fewer than 14% of teachers are confident that they can recognise a dyslexic child, and fewer than 9% feel they know how to teach one. In addition, there are visual processing difficulties that some individuals with dyslexia can experience. Furthermore, dyslexic learners can show a combination of abilities and difficulties that affect the learning process. Some may have strengths in areas such as design, problem solving, creative skills, interactive skills and oral skills. The first important point to note is that dyslexia is NOT a visual condition; the underlying cause is a difficulty in converting written letters and words into language, specifically the sounds made by the letters. But what about all of the visual symptoms? This is where the confusion arises. Dyslexics are more likely to have visual problems that happen at the same time as difficulties with decoding words. 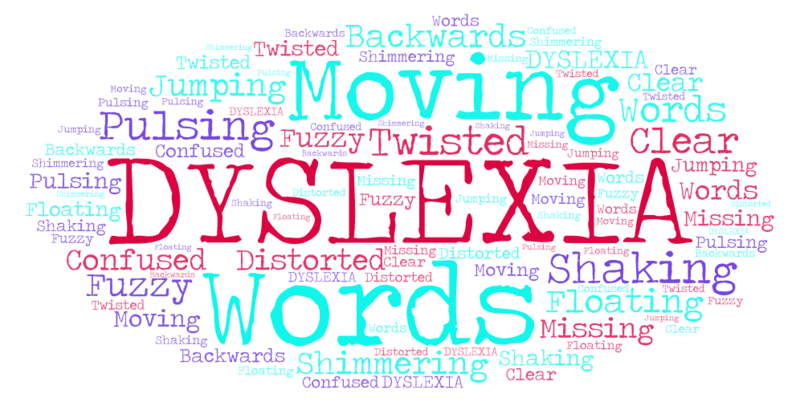 Visual difficulties often co-occur with dyslexia. Dyslexics are more likely to have difficulties with visual tracking, binocular vision and focusing (accommodation). In the majority of these conditions a child may have good “sight” but struggles to use their eyes in the right way. A small percentage can also have a condition called visual stress (aka Meares Irlen syndrome, or mislabelled as “visual dyslexia”). Focusing/accommodation relates to the ability of the lens inside the eye to maintain focus on the words and to keep them clear. Difficulty in focusing on text can cause blurry and unstable vision. Visual stress, is a condition that can make words appear to move on the page. It can affect about 10 to 20% of dyslexics and is thought to be a neurological condition caused by interference to the visual signals to the brain These problems can give rise to visual symptoms that are often mistakenly labelled as dyslexia, especially the term “visual dyslexia” which is a misnomer because this is not dyslexia. Sometimes visual stress is present with the other difficulties above, which can compound the problem. Fortunately visual stress can be treated by using a special filter with a specific colour to neutralise the interference and the movement of the text. Ask them if they are having difficulties with their sight when reading, many kids don’t report these symptoms because they are either used to them or don’t realise that they aren’t normal. Ask if they ever see words moving, or if they miss words or lines when reading, or if they lose their place on the page. These are all signs of visual problems. Unfortunately, NHS sight tests don’t cover for these examinations, in fact most optometrists don’t know about the kind of visual problems that are common in dyslexics. Behavioural Optometrists and some specialist optometrists are trained to identify and treat these visual problems that co-occur in dyslexia. Ask your optometrist in advance if they know how to assess children with dyslexia and if they are able to diagnose the visual difficulties mentioned above. Fortunately, there are a few ways to correct visual skills. Some of the options are glasses with special lenses that will help to improve many of the difficulties. Some people benefit greatly by using specially tinted glasses. Vision therapy, which involves a range of tailored eye exercises and other therapy, is an effective way to make long lasting changes to visual skills. Whilst it is not possible to treat or cure dyslexia, many of the co-occurring visual problems can be helped thus making it easier for a dyslexic to better comprehend the information they read.